I came across this week’s guest on Twitter and was so grateful for it, because her perspective and research on food systems is a complete inspiration. I’m interviewing Dr. Sarah Rotz, a postdoctoral fellow in the department of Geography at Queens University, as part of the CIHR funded “A SHARED Future” project. Sarah has a PhD in geography from the University of Guelph and has published on topics ranging from the political economy of farmland tenure and critical perspectives of big data in agriculture, to the ways that settler-colonial logics and gendered narratives uphold extractive practices and relationships on the land. As a settler-scholar-activist, Sarah’s work focuses on political ecologies of land and food systems, settler colonial patriarchy, and concepts of sovereignty and justice related to food, water, energy and the ecosystems that support them. Her current research critically explores how settler and Indigenous relationships are emerging through land-based, Indigenous food and energy sovereignty projects across Canada. We’re focusing this conversation around the idea of a global diet or globalized food systems. Given Sarah’s unique perspective and research on food systems as they relate to ideas of power, colonialism, and Indigenous sovereignty, I was really excited to speak with her on the strengths and limits to globalized food systems approaches. 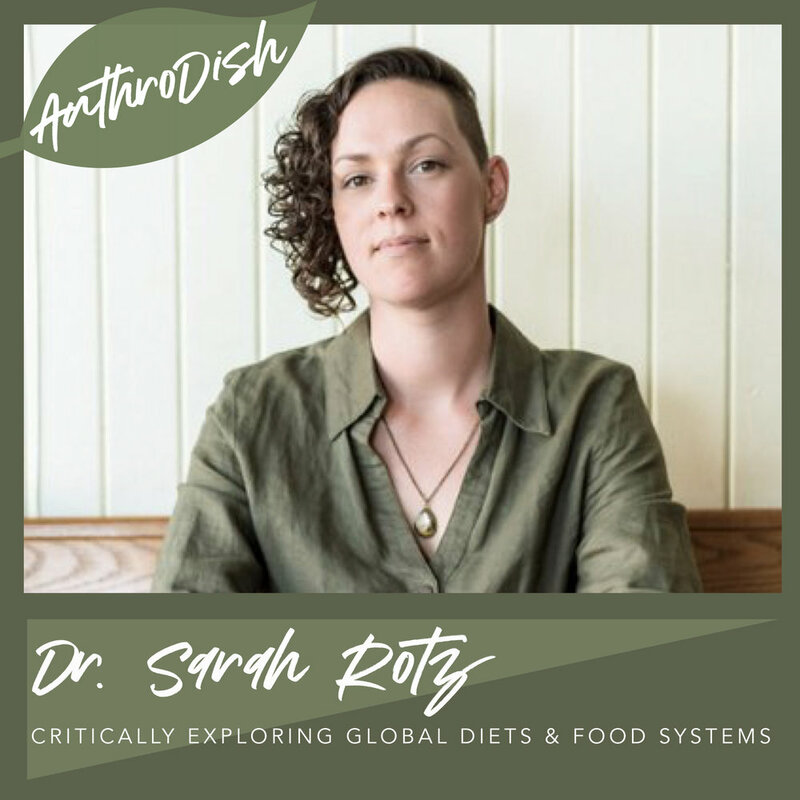 I definitely have a tendency to become somewhat negative or in my head when it comes to thinking about solutions and changes to our relationships with food and land, and Sarah shares some incredible perspectives and ways to navigate how we feel and emotionally connect with food systems. Check out the episode in the player above, or download on any major podcast platform! This week I’m speaking with the very cool Emily Harman, a sommelier and wine consultant. Emily is the independent owner of VinaLupa, a sommelier consultancy which she began in 2015 by working with restaurants and hotels in London England, advising them on aspects relating to wine and providing training to food and beverage teams. Since then, the business has grown and expanded, now reaching across a number of countries and markets in the UK, Germany, and USA. She is also one of the hosts and creators of JUICE podcast, an entertaining and accessible podcast in which Emily and her co-host Guen Douglas share stories, knowledge, and banter on their favourite bottles of wine. Today we explore the topic of natural wines and sustainability with a bit more depth – she kindly explains what the term “natural wine” encompasses, some of the challenges and benefits to these modes of production, and the integral role of farming and landscape. She also explores what makes our current era such a fascinating and fun time to be a wine consultant, and the ways wine culture is shifting for the better. For those of you listening who may be a bit daunted by the subject, Emily is wonderful at breaking down the hurdles of language and the broadness of the topic in a clear and fun way! If you’ve been listening to AnthroDish for a while, you know that the topic of disordered eating is one that holds tremendous meaning for myself both personally and from a research perspective. I am always passionate about exploring the spectrum of eating disorders with experts and had the privilege of interviewing Dr. Jillian Lampert on the neurobiology of disordered eating. Jillian is the Chief Strategy Officer for the Emily Program, a US-based program that is recognized for its compassionate and personalized approach to eating disorder awareness, treatment, and lifetime recovery. She is also the co-founder of the Residential Eating Disorders Consortium, and the Treasurer for Eating Disorders Coalition. If you ask Jillian what her goal in life is, she says its to raise her 14 year old daughter to grow up loving herself. So basically, she's awesome. It is clear when Jillian speaks that she has a passion for sharing her story and educating others about eating disorders. In our conversation, we discuss which sorts of people are more vulnerable to develop eating disorders. She explores how we have varied responses to hunger and satiation, and how that impacts our behaviours around eating. Something I really appreciate about her as a science communicator is her ability to break down neurobiological research in an engaging way, so I am excited for you to hear about all the cool work she’s been a part of. Enjoy the episode in the player above, or download on your preferred podcast platform! I’m sure it comes as no surprise that when I was a kid I was completely obsessed with ancient Rome, given that I’ve gone on to work in anthropology. So this week’s interview was an absolute dream come true for me, as I was finally able to explore these worlds with someone who knows ancient Rome so well! I’m speaking with Farrell Monaco, who is an archaeologist, baker, and food intaker. Farrell's work centres on foodways, food preparation, and food related ceramics in the Roman Mediterranean. Farrell takes archaeology a step further, and is well known for her experimental archaeology projects, where she painstakingly recreates Roman recipes using instruction and ingredients sourced from the archaeological record. When possible, she uses original Roman food preparation and cooking technologies as well. Farrell focuses on the sensory aspects of Roman food preparation itself to better understand the labour, sights, smells, textures, and flavour profiles. Her recreations are published on her wildly successful food blog, Tavola Mediterranea and have been featured online by institutions such as The British Museum, the Penn Museum, covered by the BBC, Atlas Obscura, Radio New Zealand, and Heritage Radio Network. She frequently hosts edible archaeology workshops and lectures, most recently hosting workshops at Taste of Rome in Rome, and Terroir Tuscany food symposium. Recently, she has worked as a team member on Roman Food archaeology projects with CEIPAC at Monte Testaccio, The Pompeii Food and Drink Project, and the Porta Samo Necropolis Project. Each project has provided critical data and insights into Classical Roman daily life, economy, politics, foodways and cultural identity. I’ve been following her journey for a while through Tavola Mediterranea and it is such a pleasure to be able to unpack and discuss the ways in which food — and particularly bread — played such an integral role in the economy, culture, and lives of people living in ancient Pompeii, and explore the ways these histories have unfolded and influenced our current cultures. Listen in the player above, or find on iTunes, Spotify, Stitcher, Google Play, and iHeartRadio! Tavola Meditteranea website — check out to learn more about The Old School Retreat and other upcoming events and classes! Why do some cultures get squeamish at the idea of eating bugs when other cultures use them as dietary staples? There are a lot of biases, particularly for Western folks, about what animals are and are not edible, and my guest this week, Dr. Julie Lesnik, is here to unpack these cultural attitudes around edible insects! Julie is from Wayne State University in Detroit Michigan and researches the evolution of the human diet. She focuses particularly on the role of insects as food. She is the author of the book Edible Insects and Human Evolution and recently launched a fabulous and fun science communication channel on YouTube called Octopus & Ape. The show brings Julie’s love of all things life-science outside of the classroom and to the broader public in a fun and informative way. I’ll admit going into this interview, I had a lot of biases around the idea of edible insects because of growing up as a Westerner, and Julie is great at pushing folks to think more about the powerful cultural, political, social, environmental dimensions to eating bugs. We also explore what she describes as the ugly history that Westerners have when it comes to their relationships with bugs, and she unpacks some of the harmful ways colonialism has influenced not just our own perspectives on edible insects, but negatively impacted other cultures to present day. Check out the full episode in the player above, or download on any major podcasting platform! Get Social with Dr. Lesnik! Food security is a topic that’s very close to my heart, in part because of how complex and varied experiences of food access, affordability, and availability can be. This week, we’re breaking down food security amongst LGBTQ+ communities with James Gibb. James is currently a human biology graduate student at the University of Toronto, whose research focuses on the biocultural forces affecting health and wellbeing for sexual and gender minorities. In this interview, we explore the ways in which food and diet impact health outcomes for sexual and gender minorities. Nutrition is an important factor that influences individual risk for a number of non-communicable diseases, specifically in preventing morbidity and premature mortality. Despite food insecurity being linked to a number of physical and mental health outcomes, James has found that there is little research hon the nature of nutritional health for SGMs. We explore some of the reasons that these gaps in research and health programming exist, and James makes some suggestions about how we can start to connect nutrition, health, and the social processes of stigma, isolation, and discrimination for SGM communities. Enjoy the episode in the web player above, or download on any major podcasting platform!